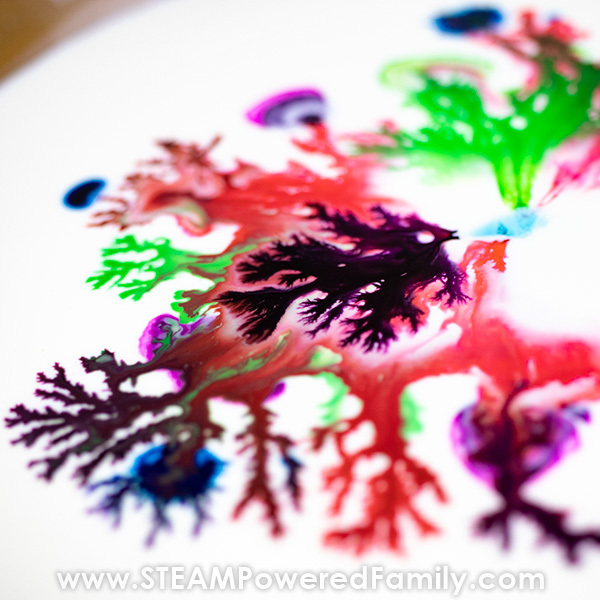 Want an extremely fun, easy, inexpensive experiment with serious WOW factor? 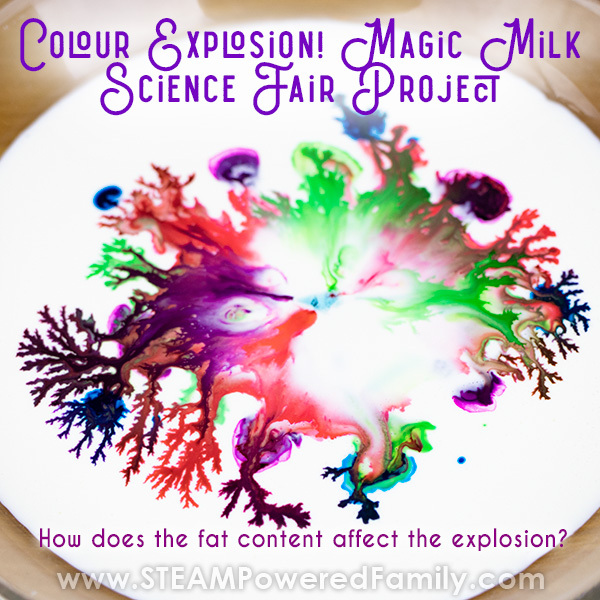 You’ve got it with this Color Explosion Magic Milk Experiment that let’s kids explore a fireworks explosion of rainbow colours that appear to move and change like magic! It’s not magic though, it’s science. 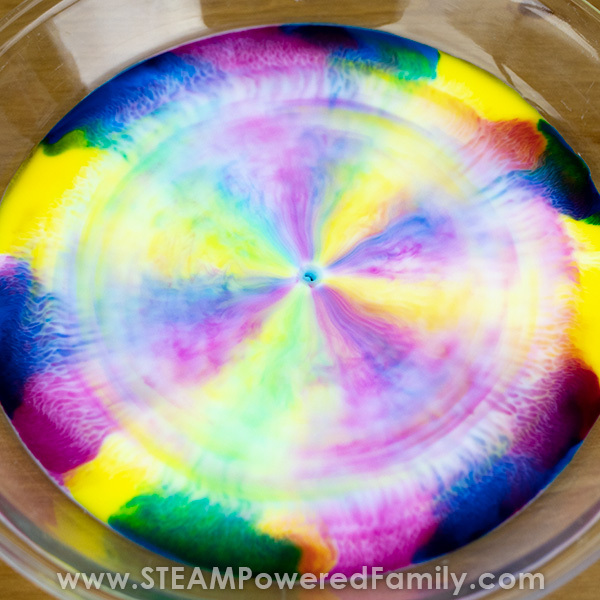 This easy science experiment is a must do for all ages. Today we have taken things even deeper by developing an entire Science Fair Project around Magic Milk. With all the crazy experiments we have done around here, from launching baking soda and vinegar rockets, to building light up circuit bugs, to magic colour changing oobleck, sometimes it’s the simple experiments that surprise us the most! This Magic Milk experiment did exactly that. With a very simple set up, and items from the kitchen, we ended up spending an entire afternoon experimenting, testing and learning. All with lots of mesmerized faces, quietly watching in awe what was happening in front of them. Here’s the thing with Magic Milk experiments, they are extremely calming and relaxing to watch. It’s like a scientific calm down dish, instead of a calm down bottle. If you need an activity to keep the kids calmly entertained as they learn, this is it! 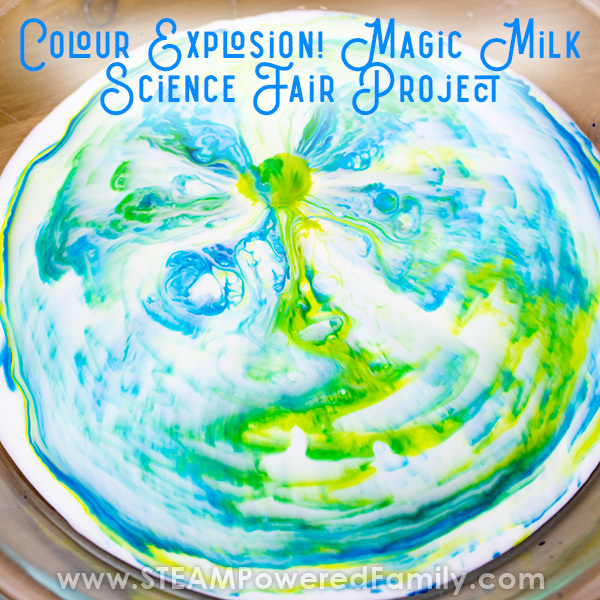 The quick and easy way to do Magic Milk is to take your milk, whatever you have in your fridge should work (as we proved with our science fair project below), then you just need a pie plate or shallow dish, dish soap and food coloring. Pour milk into the dish, we made ours about 2cm deep. We used a variety of milks in our science fair project below. You should be able to use whatever you have in the fridge. Let it settle for a moment, this will take more time the higher the fat content. Scatter some drops of food coloring in the milk. Use a Q-tip or pipette to add a drop of dish soap to the center of the plate and watch what happens! The joy of having kids that have been raised to be creative, imaginative thinkers, who embrace the Scientific Method, is that they have so many amazing questions. 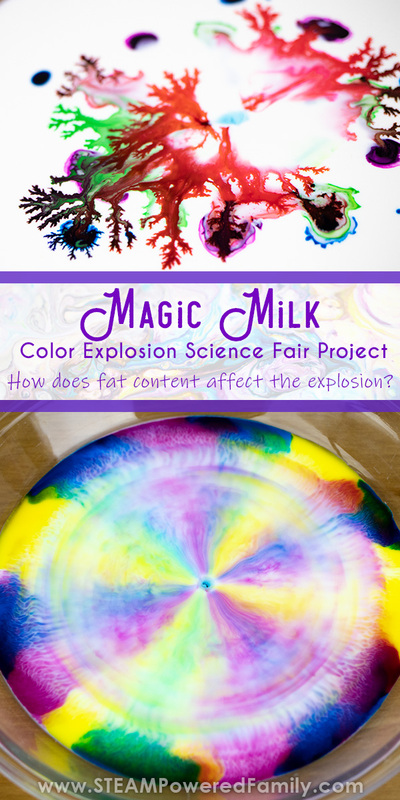 Very quickly our Magic Milk Experiment became a Magic Milk Science Fair Project. 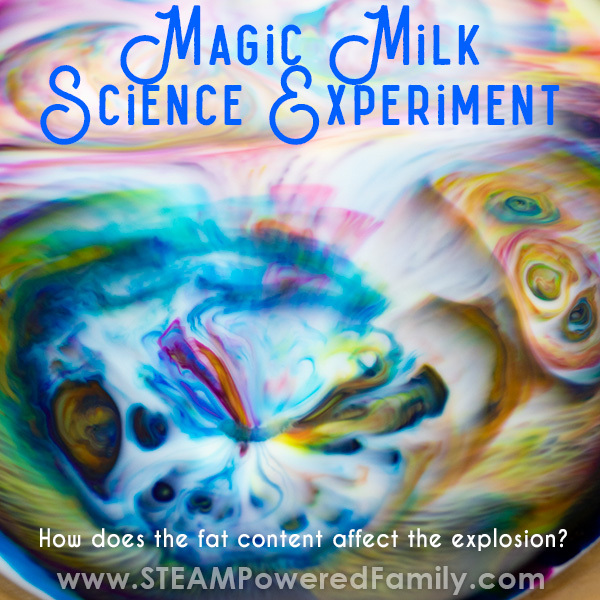 HOW DOES THE FAT CONTENT OF THE MILK AFFECT THE MAGIC MILK EXPERIMENT RESULTS? That was the big question for our science fair project. We wanted to know if the fireworks of colors created by the dish soap in milk would change at all based on the type of milk or cream we used. Specifically we look at fat content. Our research actually led us to some conflicting and confusing information about what exactly was happening during the Magic Milk experiment. Finally we found some concrete answers that made sense, especially once we did our experiments. Turns out the whole things is based on surface tension and the polarity of molecules. More on the science in a moment! Resources on Magic Milk include Scientific American and American Chemical Society. After doing our research, I pulled out the milks we had available. We were going to test 2% fat (milk), 18% fat (coffee cream) and 33% fat (whipping cream). I asked the kids to come up with their predictions and best educated guesses for what might happen. Their hypothesis was that the higher the milk fat content, the slower the colors would move through the milk. Next we set up our experiments. Our constant variables were our Dawn dish soap applied in the middle of the plate with a Q-tip, milk 2 cm deep in a pie dish so the amount of milk was consistent, a consistent number of food coloring drops scattered in a similar pattern each time. Our independent variable, the one thing we changed each time, was the fat content of our milk. We used 2%, 18% and 33%. For our dependent variable we studied how the colors exploded and moved after the dish soap was added. We watched for changes in how fast colors exploded across the milk and if there were different patterns in how the colors moved. We also timed how long the colors continued to move. 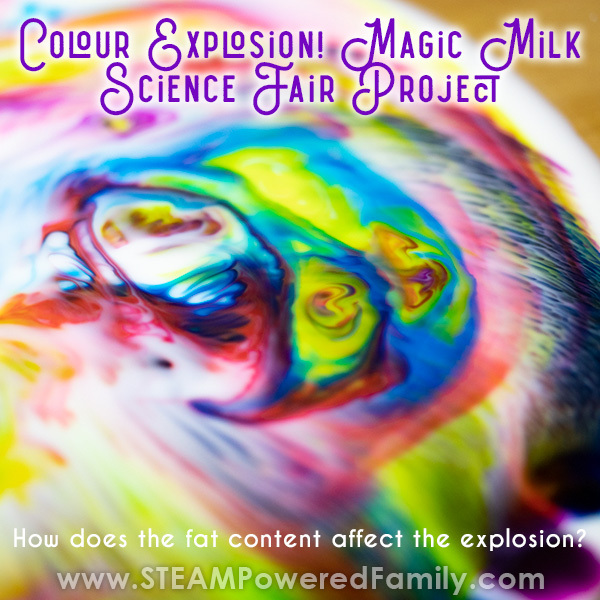 Check out our Magic Milk Color Explosion Video! Our results were striking! The 2% milk rapidly exploded with colors that flew around the plate. 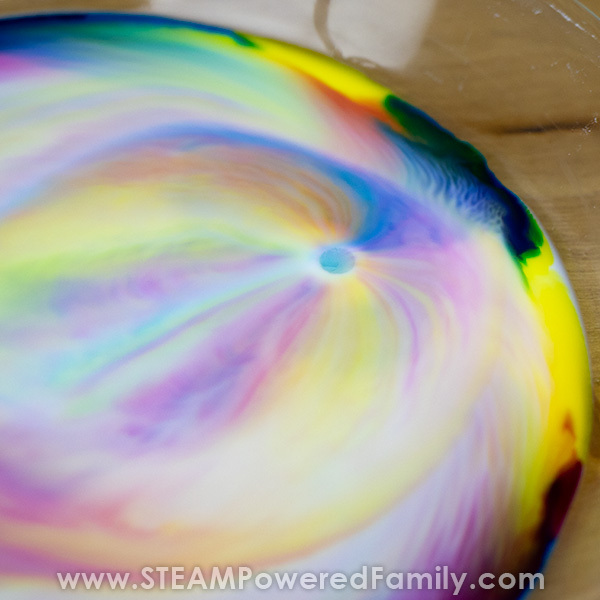 In a short amount of time the colors started blending together and the dish soap, which stays as a little bubble, started floating around pushing reactions around the plate. The colors moved and blended about, constantly moving and changing. There was a lot of action with the rainbow of colors. The 18% moved more slowly, the colors tended to stay together for a very long time without mixing. It also took a lot longer for the dish soap bubble to start moving around the plate. Once it did start moving, slowly, it did start forcing more mixing of the colors. We found the colors pushed to the edges of the plate in a multi-colored ring. This color blocking is very similar to what we saw in the Skittles Science Experiment. This made us wonder about the possibility of water stratification and concentration gradient playing a role in our results as well. 33% gave us the most astonishing and amazing results. The colors spread in fractals. Branching out in short little bursts. Like leafless branches, that never mixed into the milk. The soap bubble did not move, staying anchored in the middle of the plate where we had placed it. Very minimal mixing of the colors occurred, only happening when two fractals accidentally crossed paths. With all three we stopped our stop watch at 15 minutes as the reactions and movement were still ongoing and, although they had slowed, they didn’t seem to be ending any time soon. I mentioned earlier that when we were doing our research we came across from conflicting and even confusing information on the possible science behind magic milk. Our experiment allowed us to study how the fat content affected the movement of colours, allowing us to draw solid conclusions, informed by our research, into what exactly is happening. Our hypothesis was correct, but our results lead to even more fascinating findings! With our Magic Milk Science Fair Project we were able to study the effect fat content had on the movement of colour when dish soap is added. Our results tell us that fat content plays a large role, but the reason may be surprising. Liquids have something called surface tension. Water, milk, and cream are made up of molecules that have positive and negative charges on their surface. Just like magnets these charges allow them to attract and repel other molecules. When milk or cream is by itself, it’s molecules are surrounded by the same type of molecules, creating a nicely balanced push and pull. The exception is the top which is exposed to air which pushes down on the liquid, creating surface tension on the top of the liquid. There is a substance that affects a liquid’s surface tension, it’s called a surfactant. Dish soap is mostly comprised of surfactants. It has a hydrophilic part that is attracted to the water and a hydrophobic part that wants to interact with the fat molecules and repels water. The pushing and pulling of the fat and water molecules in the milk separates them, resulting in a decrease of the surface tension. We see a big difference between our various fat content milks due to the different ratios of fat to water in the liquids. The higher fat content milk is much thicker. We can see this before adding the dish soap if we just look at the food colouring drops. The food colouring spreads significantly in 2%, spreads a little in 18% and doesn’t move at all in 33%. This means, in our 33% milk, there is less water for the hydrophilic part to attract, and way too much fat for the hydrophobic part to ineract with. The surfactant (dish soap), has very limited effect on the surface tension, which remains quite a viscous, stable liquid. This leads to the fractal style, very limited spread of colour we see in the high fat milk. In the 2% milk we have lots of water and some fat, allowing the surface tension to be affected easily. This results in a dramatic dance of color. Already the kids have identified more testing we can do in the future. This includes testing different surfactants. They wonder how shampoo or soaps may affect our results. They also wondered if there would be a difference if we used a oil or gel color instead of liquid food coloring (which is mostly water). The kids also want to test lower percentage milks like skim and 1%, plus other types of milk like soy, coconut, goat milk, etc. to see how the different types of milk react.